Her work is currently on view in the exhibition ‘Classical Corrosive’ along with Cathy Lomax and Tracey Eastham on view in The Club Room at Century. Our curator, Leo Babsky, spoke with Corinna to discuss her influences and working process. LB: To start with could you please tell us a little about your background and career as an artist? CS: I studied as an undergraduate and postgraduate in Fine art, painting at Coventry University in 1993-6 and 2006-8 respectively. On gaining my M.A I began working and exhibiting as an artist full- time. LB: Can you explain to our members where you get the source material for your paintings from - I read that sometimes they are taken from your imagination and sometimes from historical sources? CS: Over the years I have been drawn to a wide range of source material, from texts on love and limerence, fan culture, film, performance and historical representations of women in painting. Recently it has been the historical representation of women that has become more important to my practice. LB: You work very, very creatively, was this a conscious artistic decision or something that comes naturally? CS: That's true and it's something that happens naturally, partly because I like to paint quickly and working on a small scale is a practical solution to that. 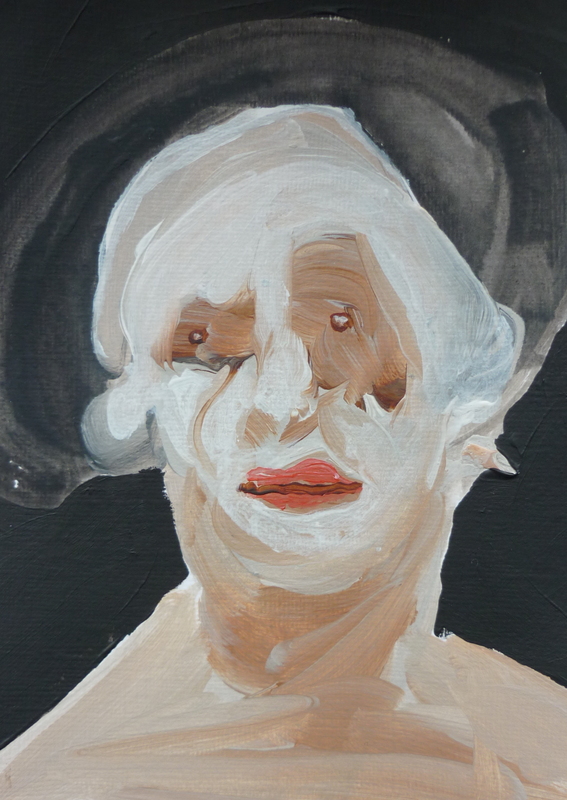 LB: Talking about conceptualism, your exhibition ‘Portrait of a Lady’ in 2015 featured 1000 small-scale paintings – can you talk a bit about how you arrived at that number/ the exhibition and the way you installed the work etc.? CS: In 2014 I won the solo show prize in the Nottingham Castle Museum and art Gallery open. Building on the work I had exhibited in the Open I wanted to make a large installation of paintings. With huge support from Tristram Aver (curator at Nottingham Castle Museum and Art Gallery) and brilliant technicianswe were able to use an existing hanging system, which would allow the paintings to hang down in to an impressive staircase. 1000 seemed like a number that would work in the space and also allow me to explore different themes within the installation. These themes included the common appearance of paintings entitled ‘Portrait Of A Lady’ in National Trust properties, Mug Shots sourced from the internet, old photo booth photographs of unnamed women and historical photographs of women in asylums. Portrait Of A Lady ran from 19 September 2015 – 17 January 2016 at Nottingham Castle Museum and Art Gallery. I have recently completed another 1000 small portraits of women as part of my solo show, Strange And Romantic at Exeter Phoenix, until 1 July. LB: Your small- scale paintings are hugely referential to miniature paintings of the 16th - 18th Century and I think your work is most potent at that scale. Was it a conscious decision to work at that scale or what was the thought process behind that? CS: I have always tended to work to the size of the space I have, while at university I was making over sized work but as that became impractical my work began to shrink in scale and I realized I could make more work this way. So really it worked out well. LB: I think often the audience has this view that there is some big artistic decision process behind a way of working but often it is dictated by practicalities i.e. the size of the artist’ work space. LB: I view your work through a feminist lens - in the time period of 16th - 18th century that your work references, the ultimate goal of womanhood (prescribed by men of course) was to be a 'beautiful object' in a way and your distortion of the women's faces basically turns this notion on its head. There is also an element of black humour as one function of miniatures was as a way of showing suitors who they would potentially be marrying (before the invention of photography) and this distortion renders that obsolete. Would you say that is an accurate analysis? CS: Yes, that is somewhat accurate, I like looking at miniature portraits, there are some lovely examples in the V&A and The Wallace collections and can almost always be found in collections at National Trust Properties. However it’s the examples of miniature paintings that are slightly odd that I find most interesting and distinguish themselves from the beautiful blandness of the others. Although not miniatures there is a group of paintings at the National Trusts Coughton Court, Warwickshire, which has had a huge effect on my work. This series of paintings was introduced to visitors as ‘The Uglies’. An example is Mary Yate (Lady Throckmorton) by William Wissing, 1656-1657 (style of) and are still the most interesting portraits I have seen at the many NT properties I have visited. I find this collection of paintings fascinating in the artists approach to the sitters features and a realness that may or may not be accurate but is, for me, far from ugly. LB: I think your work works particularly well in this semi- domestic environment (at Century) - have you ever exhibited in a non- gallery space before and do you enjoy seeing your work in this setting? CS: I have shown my work in warehouses, domestic spaces, galleries, a library and a Museum and I'm always happy to show my work in unusual spaces. The work can have a whole other dialogue with the space than that of a white wall and that can and does raise interesting questions. LB: You live outside London - Devon I believe? Can you tell us a bit about the art scene outside of London in terms of sense of community and resources? Which artists could you recommend to us who live and work outside of London? CS: Yes, I currently live in Devon and have been for just over a year, I moved away from London as a child and have lived on the south coast, Kent and the West Midlands. I think art scenes out side of London will vary depending on where you are, and having never been part of a traditional shared studio set up it would be difficult to comment on the sense of community that I know these things encourage, however I have been lucky enough to show work all around the country so for me an artists community is fairly wide reaching. What I have found since moving to Devon is a very welcoming attitude from everyone I have encountered in the arts and I am very grateful for that. Plymouth and Exeter both have a growing and exciting art scene. I am currently part of the group show ‘What Is This Place?’ at Newlyn Art Gallery, Cornwall. Painters involved in this show are from far and wide - Samuel Bassett, Rhomi Behrens, Gordon Dalton, Freya Douglas –Morris, Danny Fox, Ben Sanderson and Lucy Stein and I would recommend seeking out work by all of these artists. What Is This Place? Runs until 15 July 2017.